Transportation in Beijing is convenient and relatively cheap if you can get around the traffic. However, newcomers might shy from hailing taxis on their own due to the language barrier (the prospect of having to speak Mandarin), or a fear of being rejected by a cabbie (due to his fear of having to speak English). Fortunately, ride-hailing and rental transport mobile apps have become more commonplace. In this guide, we outline the basics of the most foreigner-friendly private ride-hailing and bike rental apps, as well as tips for a more pleasant subway journey in Beijing. Different from Didi, 神州专车 is better known for its car-renting services and long-distance commuting, although it also provides a ride-hailing service like Didi’s. It accepts booking in advance; for example, if your flight is landing in three hours, you can book a pick-up via the app according to your schedule. Its renting service means you can rent a car with a professional driver for a specific time period. It can be a lifesaver when you’re moving cities with lots of belongings, especially with pets. Didi provides a ride-hailing service within and outside China. To book a ride, you need to choose your pick-up and drop-off locations. You can add and save frequent destinations for future rides. Once matched with a driver, you will be able to see information about the driver and the vehicle. You can also check the route your driver takes to pick you up, as well as the driver’s estimated time of arrival, and real-time traffic conditions. An in-app messaging feature allows easy communication with your driver. Instant IM translation between English and Chinese is also available when you use the feature. Pay directly through the in-app payment (Alipay, WeChat pay, and credit cards work) feature or in cash (taxi only). Bike-sharing apps have taken Beijing roads by storm, having become one of the most convenient ways to commute in the city. For only a minimal rent, you can just scan a QR code on a bike then go. After two years of fierce competition, currently two bike-sharing companies are leading the market—Mobike and Ofo. • Easy “scan and go” model for a minimum rental price of RMB 1. • You can leave the bikes at any proper bike parking locations. • You need to register on your app of choice and pay a deposit, RMB 199 for Ofo, RMB 299 for Mobike. • Many users park bikes in the wrong places, or even lock them up! Besides ride-hailing and bike-sharing, the Beijing Subway might be your best bet for commuting. Even though it gets super crowded during peak hours, it’s still a better choice than taking a taxi, with a high risk of traffic jams. That’s why Metro China Subway is a godsend. It’s a very helpful app which provides an accurate Metro map and information, and route planning including route, time and fare information. No network connection is needed. Also, when riding buses or taking the subway, you need an 一卡通 (yīkǎtōng), a public transportation smart card. 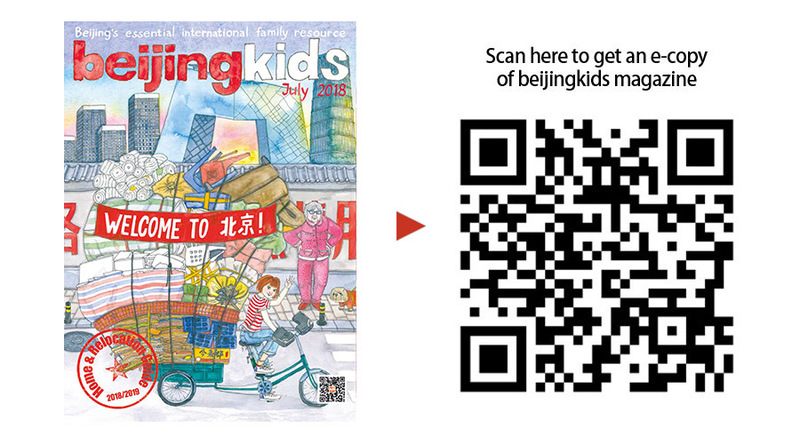 Scan the QR code for more on the Yīkǎtōng card, and on how to ride a bus or take the subway like a local. • No problem with traffic jams! This article appeared on p50-51 of the beijingkids July 2018 Home & Relocation Guide issue. What’s New in October 2018: “Roman Holiday” in Beijing, “Quantum Acupuncture”, and More!